Do you like Dead Tread? Share it with your friends. The game "Dead Tread" will take you to a race track, where usually fast monster trucks pass entertaining spectators with their dangerous racing. But as a consequence of a terrible catastrophe, all the fans of this racing sport have turned into zombies and they are slowly plodding along the race track. 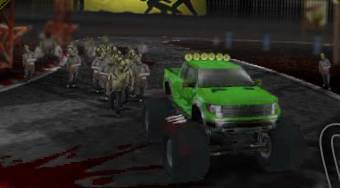 Sit behind the steering wheel of the truck with huge wheels and run over the zombies.